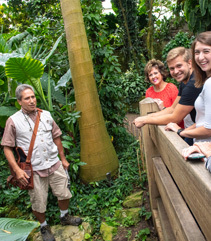 Escape to the tropics and explore the wonders of the rainforest in the Bolz Conservatory. 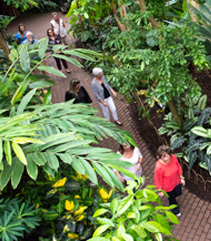 Get an insider's view of this indoor tropical oasis and discover the plants, stories, and people that make it one of Madison's most iconic places! 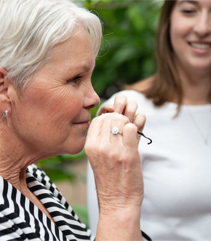 As you smell, touch, and taste your way through this guided sensory tour, you'll encounter plants both familiar and unique. More than 650 species of tropical plants call the Conservatory home, along with a rushing waterfall, free-flying birds, and colorful koi. At the end, enjoy a signature cocktail created with ingredients derived from rainforest plants. You will take home a souvenir glass along with recipes to make your own botanically inspired drinks. "I'm not a big plant guy, but I was so impressed with this experience. I honestly wasn't sure if this would be for me, but it exceeded every expectation I had." • Upon arrival, your Experience Host will meet you in the Visitor Center Lobby. • Complimentary parking is available at the Gardens. • Water is provided during the experience, but personal water bottles are also welcome. • Participants will be standing for the majority of the tour. Benches are available through the Conservatory for short rests. • A "mocktail" (non-alcoholic) version of the signature cocktail can be provided with advance notice. Give the gift of an amazing experience! Gift certificates for Garden to Glass: Totally Tropical are available for purchase by calling 243-0156 or emailing olbrichexperiences@cityofmadison.com. For groups fewer than 10 people - click here for available tour dates. Contact Olbrich Gardens at (608) 243-0156 or olbrichexperiences@cityofmadison.com to sign up for a tour. For groups of 10 people or more - private tours for larger groups are offered Monday - Friday, from 8:30-10 a.m. or 5-6:30 p.m., subject to availability. Contact Olbrich Gardens at (608) 243-0156 or olbrichexperiences@cityofmadison.com to schedule a tour. We'll offer this experience to the public on select Thursdays at 5 p.m. from October - May. Perfect for individuals, couples, or small groups of friends! All proceeds go directly to support the Gardens! • Payment is due in full at time of booking. • Experience will be held rain or shine and will be cancelled only in the event of serious inclement weather. • If the experience is cancelled due to inclement weather, you may transfer your reservation to another day. Refunds will be offered at Olbrich's discretion. Do you have 9 or more adventurous friends? Member of a book club, social group, or meet-up? Family or wedding guests in town who need entertaining? WOW your group with a private Garden to Glass experience! For private group reservations, we'll also offer a morning version of the experience finished with a tropical-inspired cold-brew coffee drink in place of cocktails. Get in touch with us to inquire about customizing this experience for your specific needs and / or budget! Note*: No tours available from March 25 - April 5 due to annual Conservatory maintenance. To schedule a private group experience, call 608-243-0156 or send an email to olbrichexperiences@cityofmadison.com. At least two weeks notice required. • Payment is due at the time of booking. • Final numbers must be provided at least 3 business days prior to the visit date. • Cancellation requests must be received in writing at least two weeks before the visit date.